As a wind player who also likes tuned percussion, I thought I would be in for a treat here. Unfortunately, this disc does not really resonate with me. I think this is largely because I don't really like jazz that much. I also find the recording itself is often a bit muddy, and would have liked to hear what would be achieved with a different configuration. Guarding the Queen of Bohemia is bright, breezy and quite syncopated, but it is very difficult trying to figure out what the music is actually trying to say. The vibraphone part is very well performed, but I find the wind parts rather boring and uninteresting. 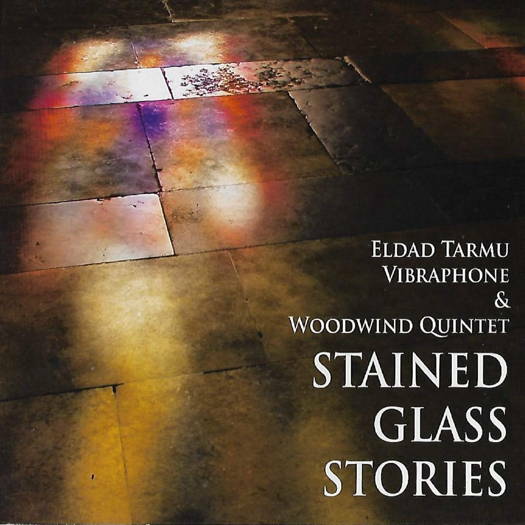 Stained Glass Stories features the wind quintet without vibraphone. There is some lovely cor Anglais playing, the soundscape is much more interesting and the melodic lines more compelling. There's an overall feeling of nostalgia, but again the music does not grab me in any really meaningful way. The vibraphone returns in Occupy, a slightly faster-paced work. Overall it's a little more interesting to listen to, and felt more integrated. I find Barefoot Waltz quite uninspiring and fail to perceive what it is about. It's slow, with strange runs and interjections. The introduction is quite long and includes a lot of strange material that I find distracting. Once the waltz itself starts, the whole thing is shaped a lot better, but then these strange interjections start again. Vibraphone and flute are the main instruments here, with worthy contributions from other players at times. It's not until the second half of Caravaggio, a type of courtly dance for wind quintet and vibraphone, that the vibraphone asserts itself. The music becomes colourful and livelier. This is one of the more engaging tracks, and seems to speak to me more readily. Tip Toe, the longest track, is unusual, and one of the more interesting works here. It reminds me of crabs scuttling across rocks at low tide, and in many places is quite evocative of its title. There is some great vibraphone and bassoon work here, and co-ordination between these two instruments is impressive. Finally, and somewhat more pensively, The Glassblower, with its repeated vibraphone notes at the beginning, sort of ties in with the opening movement, even though its character is quite different. All in all, this music is not for me. Whilst there are interesting passages, and I fully appreciate the efforts of the composer and performers, I find too often that the development of ideas gets in the way of coherent shape and results. I am sure that some people will love this disc, but it's not one that I can readily embrace.